Here’s a list of adorable board books to snuggle up with, featuring fuzzy bunnies and curious chicks that will get you ready for Spring surprises. Hattie Peck proves that there is more than enough love to go around, and any way to make a family is a great one. Grow up with the Chickies in this adorable board book series! Cheep cheep cheep! What does it take to get the Chickies to sleep? In life, we always find groups. Groups of like-minded beings (animals and people). Groups typically stick together because of race or breed, some stick together because of shared talents. It is usually these shared talents that give us purpose and sheer enjoyment in life. 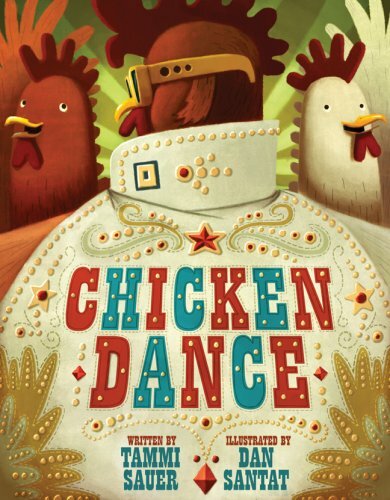 To celebrate today’s release of the new hilarious picture book Chicken Dance by Tammi Sauer and Dan Santat, the duo are hosting a YouTube Video Contest over at their site: www.elvispoultrybooks.com. I can’t wait to write a review of this book, it’s so much fun and super witty! "Busy, busy chickens. What are they doing?" Full of adorable pictures of chickens, roosters, and of course, baby chicks, this board book does not fail to captivate!